The Olympic festival not only celebrated excellence in athletics. It also provided the occasion for Greeks to produce lasting cultural achievements in architecture, mathematics, sculpture, and poetry. 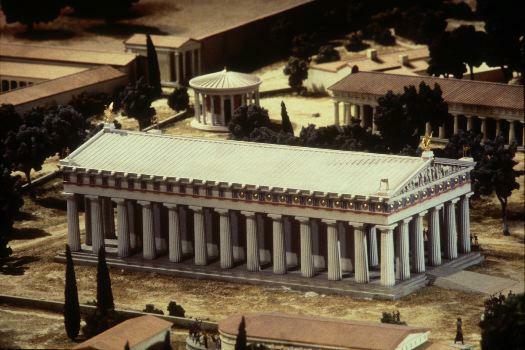 The ancient Greeks were architectural innovators. The temple of Zeus, designed by the architect Libon, was one of the largest Doric temples built in Greece. Libon tried to build the temple in an ideal system of proportions, so that the distance between the columns was harmoniously proportional to their height, and the other architectural elements were sized proportionately as well. The Greek mathematician Euclid expressed this ideal ratio in his Elements, a book on geometry which is said to be the second most popular book of all time, after the Bible. "When you came in the hall," he said, "didn't you notice a totally gorgeous statue up there, by Demetrios the portraitist?" "Surely you don't mean the discus-thrower," said I, "the one bent over into the throwing-position, with his head turned back to the hand that holds the discus, and the opposite knee slightly flexed, like one who will spring up again after the throw?" 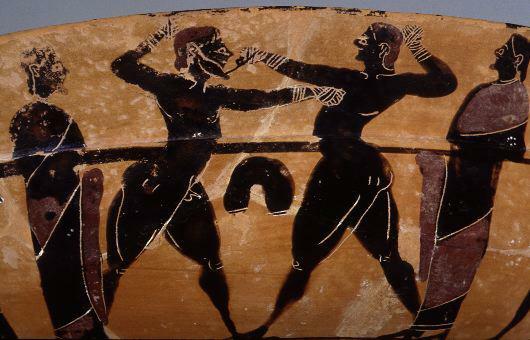 "Not that one," he said, "that's one of Myron's works, that Diskobolos you speak of..."
The cultural achievement most directly tied to the Olympic games was poetry commissioned in honor of athletic victors. These poems, called Epinicians, were written by the most famous poets of the day, including Pindar, Bacchylides, and Simonides, and they were extremely popular. Proof of this is that the playwright Aristophanes portrays an average, not especially literary Athenian man who asks his son to sing a particular forty-year-old epinician poem composed by Simonides. The poem, and the athlete, live on in people's memories long after the day of victory. The epinician odes were written to immortalize the athletic victors, and they have lasted longer than many of the statues and inscriptions which were made for the same purpose.